In which things go poorly for Bald Yoda. I do the same thing whenever I see a spider. Morpheus, a leader of the human resistance whose crazy Matrix skills have already been well-established. Played by Laurence Fishburne. Agent Smith, the point man for the trio of hunter/killer programs who take care of “problems” within the digital world. All these A.I.s are sentient but Smith seems to have the most personality of the three, which manifests itself in a personal animosity against humans and the gleefulness he takes in rubbing them out. Played by Hugo Weaving, in a performance that instantly catapulted him from little-known cult actor to permanent Geek Royalty. Armed with: presumably he has the pistol that all agents manifest with, but he doesn’t use it here. He doesn’t need to. The Setup: Morpheus & crew are returning from a visit to the Oracle, but end up on the run after being betrayed by one of their own, Cypher (oh, if only he’d clued them into his devious nature, perhaps by picking a name that signaled his intentions were less than transparent!). They’re sneaking through the walls of a hotel when their lead pursuer gets too close, prompting Morpheus to take one for their team so that the rest (especially Neo, whose potential Morpheus is fanatically devoted to) have time to escape. I must say his roar of determination when he smashes through the wall to meet his presumed destiny is quite impressive. He’s left alone with Agent Smith in a bathroom that’s small for a fighting arena but actually quite spacious as a bathroom. For all they’ve been seen & discussed throughout the movie, this is the most we’ve seen of an Agent so far. The threat of them has been both implicit (Trinity is clearly terrified of them in the opening scene) and explicit (Morpheus flat-out declares that not one human has ever successfully faced down an Agent), but now it’s time to show rather than tell. And how. Indeed, the fight goes terribly for Morpheus. Many of his blows don’t land, and the ones that do seem to cause Smith only a slight annoyance at best. Meanwhile the resistance leader takes a real clobbering here, absorbing repeated blows and getting tossed into things, including a particularly painful-looking bang to the head on the toilet during a fall. As great as the Wachowskis made Morpheus out to be earlier, he’s spared no dignity here. It’s brutal. I must say that Fishburne sells it all like a champ, showing equal parts pain & determination as he gets covered in plaster and knocked around like a ragdoll. Weaving meanwhile plays it all utterly untroubled, his movements not graceful so much as they are ruthlessly efficient. With one final crash on the ground, Smith can tell his enemy has been so suitably subdued he doesn’t even need to finish the job. He walks away in disgust and leaves a squad of riot cops to detain poor Morpheus. It’s not an epic battle but, as the refrain goes, it’s not meant to be; it’s quick, dirty, and mean. Morpheus knowingly bites off more than he can chew, and pays the price for it. All at once the scene conveys Morpheus’ devotion to the cause, the staggering power of the enemy, and the desperate circumstances the remaining heroes are left in. Recommended Links: Agent Smith has popped up on your screens again lately, as the Wachowskis have licensed the character (played by Weaving) to appear in ads touting General Electric’s medical technology. Because nothing says “edgy transgressive filmmakers who love stories about upending the dominant power structure” like using your creation to shill for an enormous multinational corporation that’s notoriously cozy with the U.S. government. 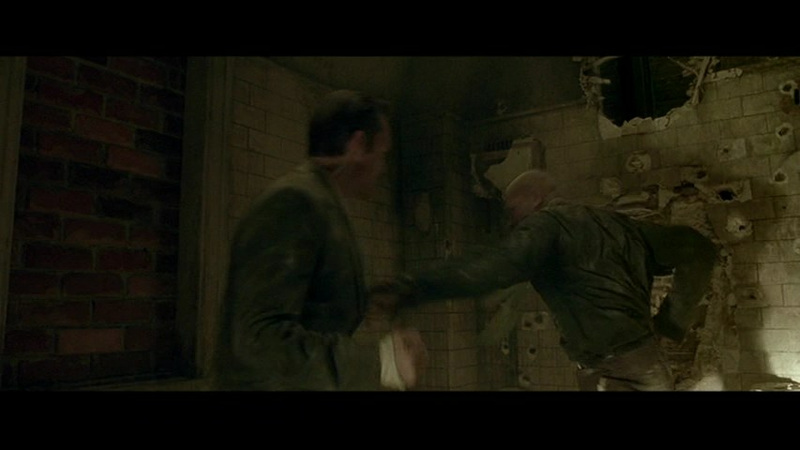 This entry was posted in Matrix, The and tagged martial arts, one-on-one, sci-fi, The Matrix.